The canyon faces three serious threats, each with a key decision this year: the massive Escalade construction project in the heart of the canyon, pollution from uranium mining on the north and south rims, and expansion of the town of Tusayan that could deplete vital groundwater supplies. These threats would cause irreparable harm to the river’s unique wild character, clean water, and cultural values. American Rivers called on Secretary of the Interior Sally Jewell and the Obama Administration to use every authority to prevent damage to the river and preserve the Grand Canyon for all Americans to enjoy. 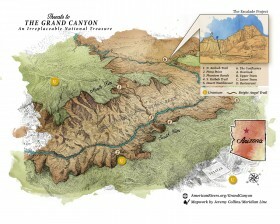 The proposed Grand Canyon Escalade project includes a two million square foot development on the canyon rim, a tram delivering up to 10,000 visitors a day to the bottom of the canyon at the confluence of the Colorado and Little Colorado rivers, and riverside walkways, restrooms, a gift shop, and restaurant. The massive amount of construction, noise, and pollution would irreversibly harm the fragile heart of the canyon. The confluence, the site of the project, is a sacred area for native tribes. “This billion dollar scheme would be a travesty, destroying the very qualities that make the Grand Canyon such a spectacular life-changing experience, and an economic engine for the region,” said Irvin. In addition to the urgent threat of the Escalade project, existing and proposed uranium mining operations threaten the clean water of tributary streams in the Grand Canyon and the Colorado River. And, a major expansion of the town of Tusayan, which lies less than five miles from the south entrance to Grand Canyon National Park, threatens sensitive groundwater supplies. Depleting already-stressed groundwater could impact the seeps and springs that feed the Grand Canyon, threatening the fragile desert environment.